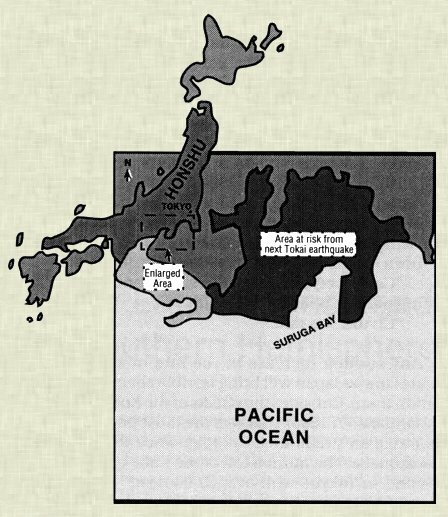 The Tokyo area lies at the southern end of "the greater portion of Japan [that] must go into the sea." This according to archangel Halaliel's communication in Cayce reading 3976-15, and to my interpretation of that reading, as presented in Coming Earth Changes (CEC). I gave special treatment in CEC (p. 132) to the Tokai region, lying just west of Tokyo, because one of Japan's top earthquake experts, K. Ishibashi, had written, "When the [next] Tokai earthquake does occur, it will plunge the Tokyo area into a period of intense seismic activity marked by the repeated occurrence of magnitude 7-class earthquakes." And according to a January 24, 1998, piece in the New Scientist, authored by P. Hadfield, "An alarming increase in seismic activity along one of Japan's most dangerous fault lines has been detected over the last 18 months." The situation has quieted down somewhat since 1998, but remains very dangerous. 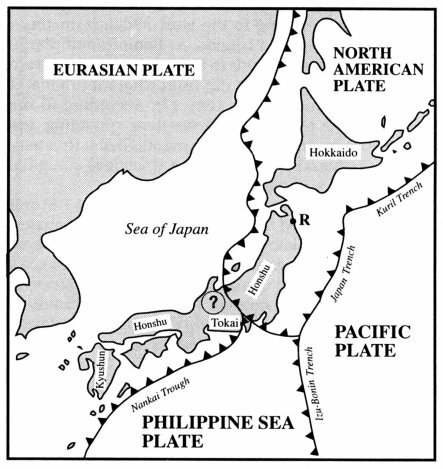 The fault line referred to by Hadfield marks the boundary between the Eurasian and Philippine Sea lithospheric plates, some 80 miles west of Tokyo. Japanese seismologists have discovered that a long segment of this fault line, running beneath Suruga Bay, has had no significant earthquakes since 1854. And historical records suggest that a major quake occurs along this segment about every 140 years. But the Earthquake Assessment Center in Tokyo had over an 18-month period found that the fault segment displayed an ominous increase in earthquakes of M4 or stronger, as the Philippine Sea plate pushed northwest beneath the Eurasian plate. In 1998, Hadfield said that these quakes amounted to seven in the past 18 months, "compared to just 17 in the previous 17 years," and that while sometimes moderate tremors can relieve stress on a fault and make a major earthquake less likely, a senior seismologist says this is unlikely at Tokai, "as the amount of energy released so far is only about 0.1 percent of that of the anticipated quake." The estimated quake will have a magnitude of 8.1, or roughly 25 times the power of the devastating 1995 Kobe tremor. "The government of Shizuoka prefecture [covering part of the Tokai region] closest to the epicenter, estimates that 500,000 buildings in the prefecture will collapse, burn down, or be washed away by tsunamis." As for Tokyo itself, Ishibashi stated in 1988 that the projected Tokai-region quake will trigger a series of geophysical events below Tokyo that will be powerful enough to destroy large parts of the city. A couple of possibilities come to mind. Earthquakes along faults underlying Tokyo could be triggered by a great Tokai tremor. This receives support from the work of two geophysicists who have identified "two highly significant seismic quiescence anomalies that started in 1993 [and which] exist concurrently within about 40 km [25 miles] of Tokyo....in Saitama province and in Tokyo Bay...." M. Wyss and S. Wiemer (Geophys. J. Int., 1997, v. 28) also state that some large earthquake shocks are preceded by seismic quiescence, which is a decrease in the average rate of earthquake occurrence as compared to the background rate in a particular volume of the Earth's crust. And they suggest that the two Tokyo-area quiescences may well end with quakes of M6.5 or so, anytime now. No doubt Mr. Ishibashi would say that such M6.5 quakes could be triggered by an M8.1 quake in Tokai. Another of the "geophysical events below Tokyo" that could be triggered would be a sudden, temporary fluidization of the foundation soils underlying parts of Tokyo, due to earthquake shaking. This would have devastating consequences for the buildings above. How imminent is the next Tokai quake? The Bible code (Drosnin, M., 1997, Simon & Schuster, NY) implicates the years 2000 and 2006 as years for great (M8.0+) earthquakes in Japan. Seismologists who are willing to speculate say they might be able to provide only a two or three day warning, based on sensitive observations of land elevation just west of Suruga Bay. They anticipate this land to begin to rise shortly before a substantial quake. Hadfield writes that for the past 140 years, this area has been sinking, pulled down by the descending Philippine Plate. But in the 1990s this sinking has slowed markedly, a sign that the Eurasian Plate may be resisting the pull and is ready to recoil, causing the quake. The last great Tokai quake occurred in a sparsely populated farming district; today, however, the region is populated by 7.5 million souls, living in over 170 towns and cities. And it is now home to many oil refineries, industrial complexes, and petrochemical plants. A great earthquake in Tokai today would do enormous damage, both to the region and to Tokyo. It's no wonder that Japanese governmental bodies have pumped significant resources into monitoring the seismic situation in and around Suruga Bay, and in planning for disaster relief should the dreaded event occur.